“These scones are delectable!” said my daughter/baking partner (& fan of “Fancy Nancy” books :)). This recipe is from Martha Stewart Living. I tried to make them “healthier” (if any scone could be considered healthy!) by using whole wheat flour. 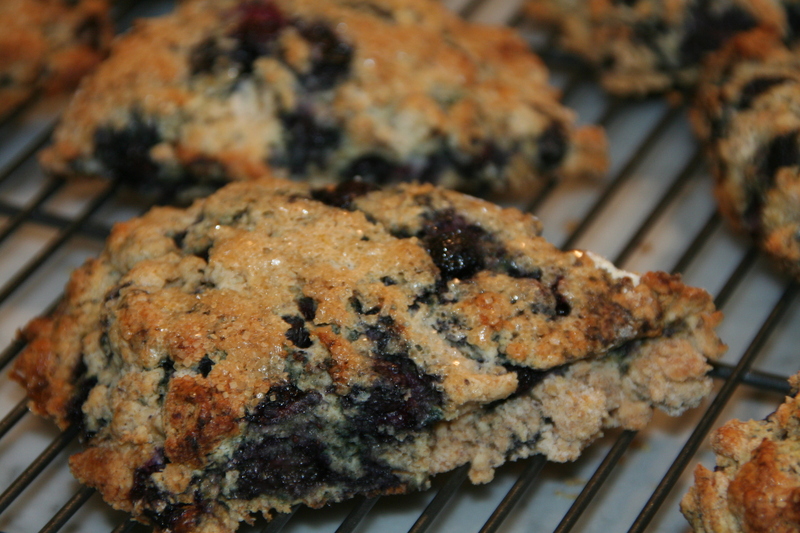 The secret to a tender scone is to really limit the amount of mixing and kneading of the dough. I didn’t really knead the dough at all- after incorporating the liquid ingredients, I poured it out onto wax paper, and formed it into a 6×6-inch square before cutting. Just forming it into a square seemed to be enough “kneading”. To add just a touch of sweetness, and sparkle, I sprinkled the top of each scone with turbinado sugar before baking. They could be eaten with jam- but we just ate them plain, warm from the oven- PERFECT. Preheat oven to 400 degrees, with rack in center. Place a baking mat on a baking sheet, and set aside. In a large bowl, sift together flour, 3 tablespoons sugar, baking powder, and salt. Using a pastry cutter or two knives, cut in butter until the largest pieces are the size of peas. Stir in blueberries and zest. Using a fork, whisk together cream and egg in a liquid measuring cup. Make a well in the center of dry ingredients, and pour in cream mixture. Stir lightly with fork just until dough comes together. Turn out onto a lightly floured surface, and knead a few times to mix well. Pat dough into a 6-inch square about 1 1/4 inches thick. Using a floured knife, cut into four 3-inch squares. Cut squares in half on the diagonal to form eight triangles. Transfer to prepared baking sheet. Brush tops with cream, and sprinkle with sugar (I use turbinado sugar). Bake until golden brown, 20 to 22 minutes. Transfer scones to wire racks to cool.